It started with Pat Rafter – my interest in watching tennis. Or shall I say it started when I was playing evening tennis once a week in the late 90s. Whichever comes first doesn’t matter as I’ve to profess I’m a die-hard fan of grand slam finals - certainly when Federer is playing. I started to park myself in Federer’s camp since he defeated Pete Sampras in 2001. I admire his one handed back-hand and his artistry and elegance on court. He is able to bring beauty and grace to tennis that sets him apart from the rest of the power players. 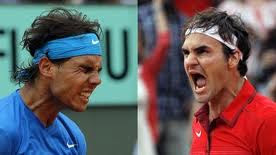 I also like Nadal, not so much his playing style but I admire his tenacity and competitive spirit. I think he is the only player I know that would run for every ball. I like his humility and the way he downplayed his greatness. So, we are very fortunate to have two great players in this era, probably the best in tennis history to ever grace the stage and to watch them play against each other is a real treat to all tennis fans. And every time they play each other, the match is never a let down because these players give their all to the game. And most of the matches can be considered epics that fans would watch again and again. One of them is undoubtedly the Wimbledon Final 2008. The French Open 2011 Final over the last weekend was almost an epic too. What I can draw from this match was whenever one of them has been broken serve, he will step up a notch higher in the next game and under pressure, came out better with remarkable shot making that simply made me speechless. You can say that’s what champions do, ever ready to perform under tremendous pressure. I say rivalry or competition draws out the best from them. They have the greatness within them and as they faced their toughest opponent, they push themselves hard to throw their best and whatever left out of them. Greatness is produced in such circumstances. The tougher the competition, the better it is. That’s how greatness is born!